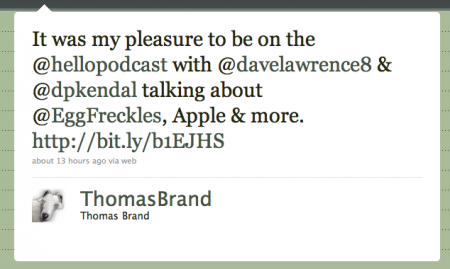 David and I had a very special guest on The hello Show, episode 12: Thomas Brand of Egg Freckles. Thomas was nice enough to share some of his stories as a head Apple Store Genius, why he has such a cool job, and which were some of the worst Macs to repair back in the day. His Egg Freckles blog has been an inspiration since the early days of Newton Poetry, and Thomas is always a good source of MessagePad-based stuff. Much like Grant, talking to Tom for the show helps personalize the fun folks you talk to through Twitter or who leave comments on the blog. We now know what the guy sounds like, and that’s pretty cool. Enjoy the show by downloading the MP3 off the site or subscribing through iTunes. Posted by davelawrence8 at 6:20 am on August 20th, 2010. One comment... » Categories: hello show, macs. Subscribe via RSS. Posted by Newton Poetry — Thomas Brand’s simple desk on December 15th, 2010.